Mrs. Rosa Parks asked a question of the policeman who arrested her for refusing to move to the back of the bus on December 1, 1955. In 2016, it is again, and still, a chilling question, to which we have no good answer. (Grand Rapids, MI: Zondervan Pub. House, 1994), page 23. 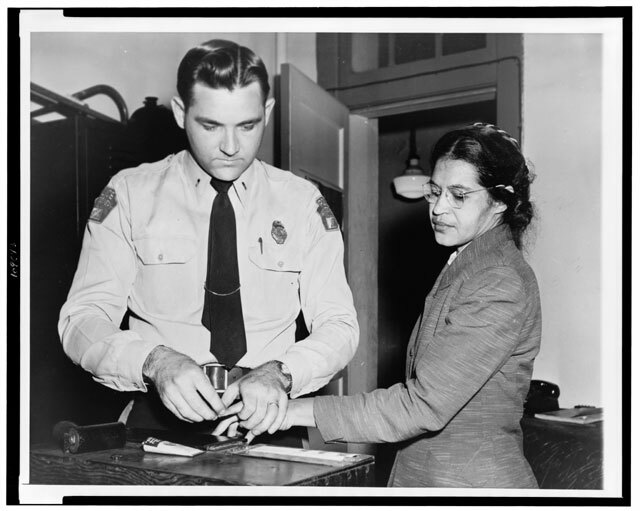 On the evening of December 1, 1955, Rosa Parks, an African American, was arrested for disobeying an Alabama law requiring black passengers to relinquish seats to white passengers when the bus was full. Blacks were also required to sit at the back of the bus. Her arrest sparked a 381-day boycott of the Montgomery bus system and led to a 1956 Supreme Court decision banning segregation on public transportation. Rosa Parks made a nearly perfect subject for a protest on racism. College-educated, trained in peaceful protest at the famous Highlander Folk School, Parks was known as a peaceful and respected person. The sight of such a proper woman being arrested and jailed would provide a schocking image to most Americans. Americans jolted awake. Often lost in the retelling of the story are the threads that tie together the events of the civil rights movement through the 1940s, 1950s and 1960s. As noted, Parks was a trained civil rights activist. Such training in peaceful and nonviolent protest provided a moral power to the movement probably unattainable any other way. Parks’ arrest was not planned, however. Parks wrote that as she sat on the bus, she was thinking of the tragedy of Emmet Till, the young African American man from Chicago, brutally murdered in Mississippi early in 1955. She was thinking that someone had to take a stand for civil rights, at about the time the bus driver told her to move to allow a white man to take her seat. To take a stand, she kept her seat. African Americans in Montgomery organized a boycott of the Montgomery bus system. This was also not unique, but earlier bus boycotts are unremembered. A bus boycott in Baton Rouge, Louisiana, earlier in 1955 did not produce nearly the same results. The boycott organizers needed a place to meet, a large hall. The biggest building in town with such a room was the Dexter Street Baptist Church. At the first meeting on December 5, it made sense to make the pastor of that church the focal point of the boycott organizing, and so the fresh, young pastor, Rev. Dr. Martin Luther King, Jr., was thrust into civil rights organizing as president, with Ralph Abernathy as program director. They called their group the Montgomery Improvement Association (MIA). When their organizing stretched beyond the city limits of Montgomery, the group became the Southern Christian Leadership Conference. Litigation on the boycott went all the way to the Supreme Court (Browder v. Gale). The boycotters won. The 381-day boycott was ended on December 21, 1956, with the desegregation of the Montgomery bus system. Tip of the old scrub brush to Slacktivist, who gave this post a nice plug. Hillary Clinton secretly filmed at a Goldman Sachs event, speaking to Goldman Sachs executives. Okay, not secretly filmed. But you didn’t see this on the news, did you. We can do better than that: How about a secret video of Hillary Clinton talking to the executives at Goldman Sachs, one of the world’s leading investment firms? After all the hoo-haw, you’ll be shocked at the content. 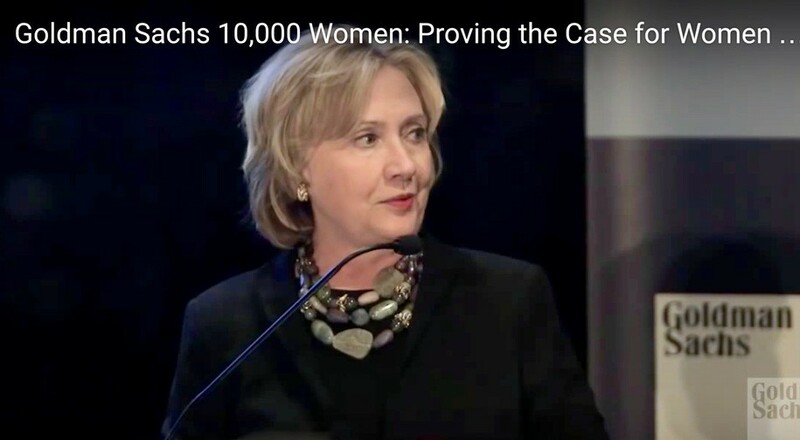 On September 23, 2014, Goldman Sachs 10,000 Women hosted its annual dinner at the Clinton Global Initiative. The event featured a keynote address from former Secretary of State Hillary Clinton on the business case for empowering women to ensure future economic growth. True to Clinton’s history, she tells people with power and money they have to do a much better job of empowering and hiring from groups known to lack power and money, for the sake of capitalism, for the sake of our nation, for the sake of the world. Okay, so it’s not secret. People who complain about these speeches pretend she said something different, and they certainly don’t want you to know what Clinton actually said. Clinton’s opponents hope this video remains close to secret. Shocking that these speeches continue as an issue. Maybe they should be campaign ads, for Clinton. Tip of the old scrub brush to Leslie Salzillo and DailyKos.